The same as Dazzle, but enhanced by the power of oxygen bleach. This makes it very effective on all colors and fabrics without fading or dulling. Oxygen bleach also enhances stain removal. 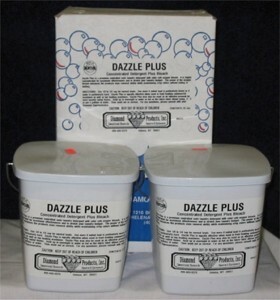 We have found that with this formulation, you may be able to use 1/8 cup instead of 1/4 cup recommended for normal Dazzle. Septic safe.